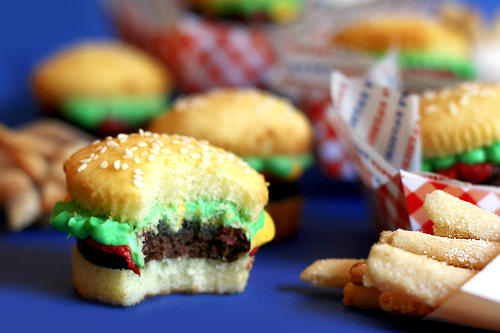 Cupcake Buns + Brownie Burgers + Cookie Fries = One Happy Meal! I can hardly stand how cute these little guys are. You’ve probably seen them around before. I know I have. Cupcakes Take The Cake has featured cute ones. But, they are even cuter in person as I discovered this weekend. Oh my gawd… they just make me want to smile. I switched mine up a little by doing the burger out of brownies. 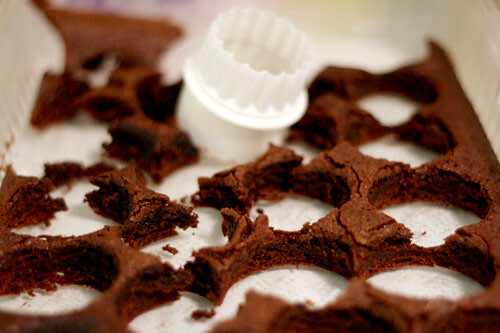 But, you can just as easily make chocolate cupcakes and cut them in thirds to use instead. And if you want more realistic lettuce, tint some coconut (yuck) green. 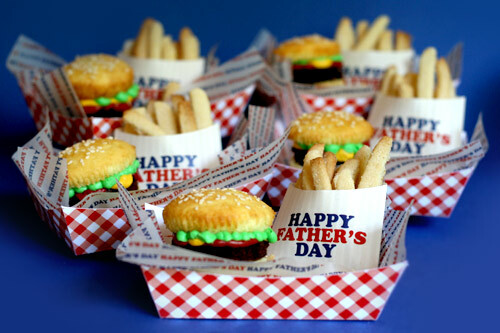 I really decided to make these when I thought about making a meal out of them for Father’s Day, complete with sugar cookie french fries. I wasn’t sure if they would turn out, but I am so thrilled with the end result. Actually, I think the fries might be my favorite part. Before I started baking, I made a template for a miniature paper box tray and french fry holder. You can download the 4-page pdf (636 KB) here if you want it. 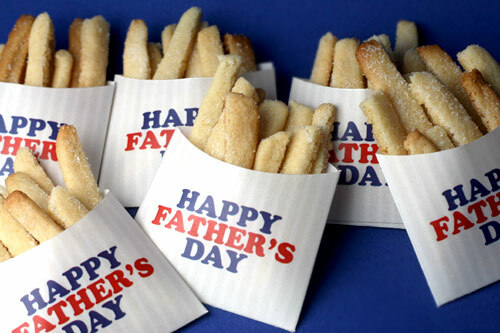 The pdf contains the tray template, french fry holder template (blank & with Happy Father’s Day). 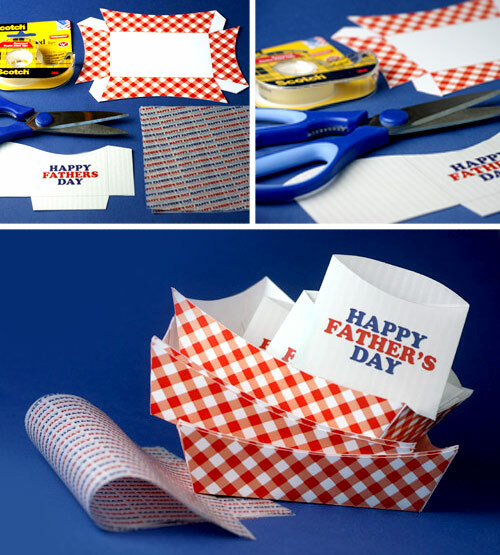 It also includes the design for the Happy Father’s Day tissue paper. I printed the tray template on card stock (heavier weight paper), the french fry template on vellum (semi-transparent paper) and the tissue insert on tracing paper (really thin paper from Canson Art pad). All three paper weights went through my printer fine – one sheet at a time to be safe. But, if you’re unsure about running the tracing paper through your printer, then just use regular plain white tissue paper. Cut out the shapes as shown in the picture above with scissors or a sharp blade. Then fold along all the printed lines. Use double-sided tape to secure the flaps. Cut the tissue paper in half and place in the tray print side down. Now, for the baking. Keeping with the fast food fun theme, I went all mixes on these. That’s right. I said mixes. For the cookies, brownies and the cupcakes. Don’t cringe. You know I love learning to bake new things from scratch because it’s really empowering and satisfying and it usually tastes better, too. But, before a couple of years ago, I did all my baking from a box and really don’t have a problem using a mix. There, I said it. I feel better now. So, I picked up several kinds. The brownies baked first in a 13 X 9 pan. You don’t need any help there. The cookies came next. I wanted to do rolled sugar cookies and luckily Mrs. Crocker offered some tips on how to convert the mix for better results. Except I didn’t do the whole floured surface thing. I used parchment paper underneath and on top of the dough. 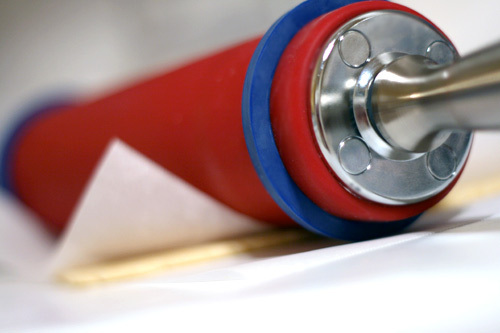 Then I rolled it out with a rolling pin using rubber band spacers attached to ensure an even thickness. This is a really handy trick and so not messy. I got these tips from the book, Cookie Craft . If you want to learn more about rolled sugar cookies, it’s great. See… perfectly even dough and a clean surface. Here’s where I started experimenting, but it worked out pretty well. 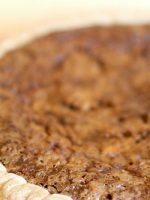 Cut the dough in thin strips with a sharp knife and then a long cut down the center. The varied lengths are fine because you don’t want all your french fries exactly the same size. 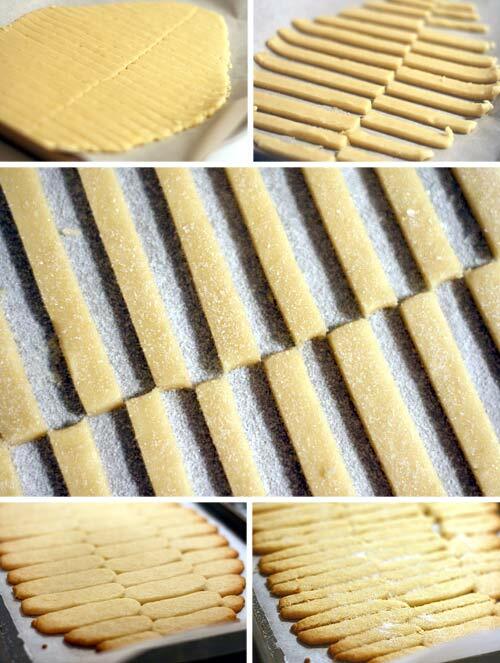 Remove the alternating strips so it won’t bake into one giant blob. (Reserve dough strips and repeat) Sprinkle sugar on top of the dough. Bake for about 8 minutes at 350 degrees. These spread more than I had hoped they would for rolled sugar cookies. I know. I know. The mix thing. But, no problem. Just take your knife and cut each “steak fry” down the center for “skinny fries.” Do this right when they come out of the oven. Sprinkle more sugar on top while they are still warm, too. Lightly rub it on to make sure it sticks good. A big pile of fries. Yum! Try not to eat too many before you serve them. You can’t eat just one. Trust me. 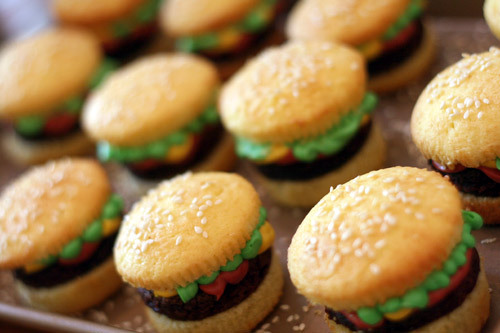 Next up… cupcakes. I made these the next morning to spread out the work. Boxes, brownies, and fries on one day. Cupcakes and decorating the next. 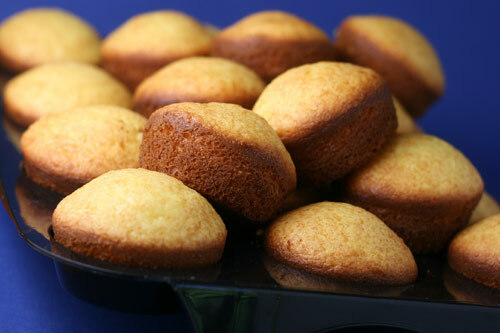 I baked 24 cupcakes using a yellow cake mix. I also exchanged 1 cup of buttermilk instead of the water. It made them nice and yummy. To test, I greased and floured one 12-cup cupcake tray and used Pam on the second. I wanted my buns to have smooth sides, you know. Well, they came out smooth, but also brown. You can see what’s coming. Yes. Yes. I made 24 more cupcakes. This time I used milk instead of water. No reason. Just to try it. They were good, too. And this time I used paper liners to ensure the right color cupcake bun. Now it’s time to assemble. 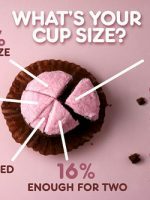 Cut each cooled cupcake in half or thirds depending on how tall it is. 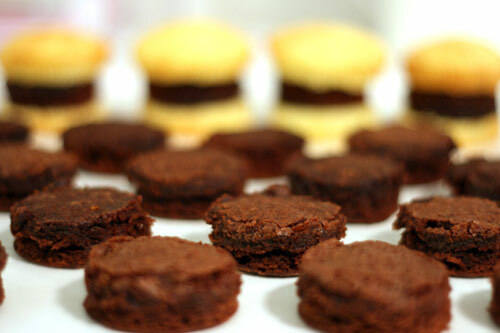 Cut out 24 circles from the completely cooled brownies and place in between the cupcake bun. I used my ever so handy graduated circle cutters to do the trick. Size 2″ for uniform burgers. Then… and this might be the most important thing. … You’ll figure something out. 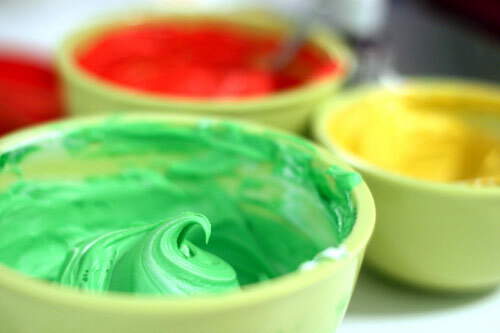 Divide the canned frosting in three bowls. Two can have equal amounts for the mustard and ketchup. The third – a little more for the lettuce. The colors I used to tint were, Wilton Leaf Green , Wilton Golden Yellow , and Americolor Super Red . To make the red a little deeper, use a tiny bit of violet when you mix. 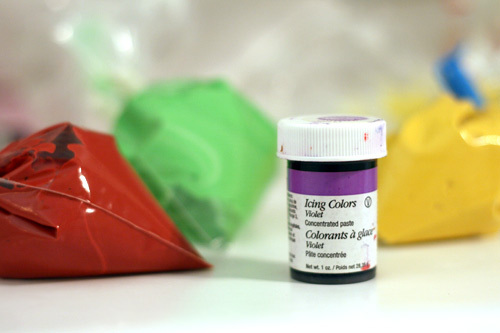 Place each color in a ziploc bag and snip a small tip off one corner. Gently squeeze out the mustard and ketchup first. Then the lettuce in more of a squiggly design. Place the top of the bun on and press gently. Now for the finishing touch. Brush a very thin layer of water over the top of the bun or either dab a few drops of water on with your finger. Sprinkle sesame seeds on top and they’ll stick. 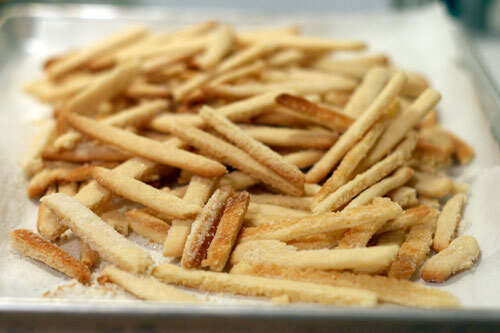 And Sugar Cookie French Fries. 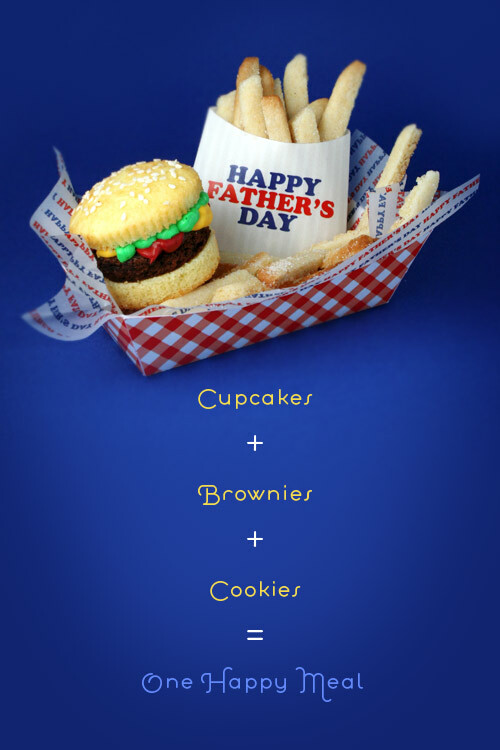 A perfectly sweet meal for Dad’s day or any day. And, if you use this template, there’s a blank french fry holder in it. Use it and you can serve these for a family cookout or Fourth of July party. People will go crazy for them, don’t you think. Tasty, too! Hope you like them. Now, I’m curious. When it comes to mixes, how do you roll? Use them? Refuse them? Or improve them? Now don't get me wrong, I love scratch baking too, but oh sweet Lord what would I do without mixes?! When I want something quick, or I'm multi-tasking its mixes all the way. Cute! It does look like little hamburgers and fries! I don't usually use mixes cause mixes that we have in Australia are pretty crappy. i don't use mixes anymore but i used to! and they were great to experiment with! Oh man that's actually the cutest thing I've ever seen. Wish I had the time and patience to pull it off! very cute idea. i have to stash this idea away for my son turns 2. Those are really cute btw. I need an excuse to make them! Was that enough frosting for the cupcake AND brownie? I think it would be cute to have a little container of "ketchup" on the side. Oh, those are so lovely. Wish we could all eat dessert instead of dinner food. Those are freaking adorable! I usually do from scratch, but if I'm in a pinch, I'll doctor up a cake mix. 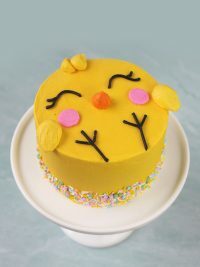 One of my favorite cakes is banana cake with quick caramel frosting, which starts from a yellow cake mix. Try it sometime–yum! LOVE the burgers, I am for sure going to give them a try. Man, those are soooo cute! This is such a darling idea! I am in love. I am a fan of brownie mixes. I love them :) Homemade cakes are my favorite though! OMG those are absolutely adorable! I almost exclusively use mixes and sometimes add a little something but most of the time I just use them as the instructions suggest. these are amazing! you've really outdone yourself. sometimes i use cake mixes but it just really depends on how much time i have and how difficult the project is that i'm working on. Oh my gosh!!!!! That is so cute. How do you have the patience to create all of your ideas?!! I guess because I have twin boy toddlers I don't have much patience for anything!!!!! I just started baking from scratch. I used to use "plused" box mixes, but I needed more variety than I could get from a box. And now I'm off to craft Strawberry Shortcake cuppies for DD! Ohh BOY! I 'am in trouble! I love these, what a great idea! I use a mix for the cake, but always homemade frosting. Wow those are so cute! Just wondering do you think they would freeze OK. 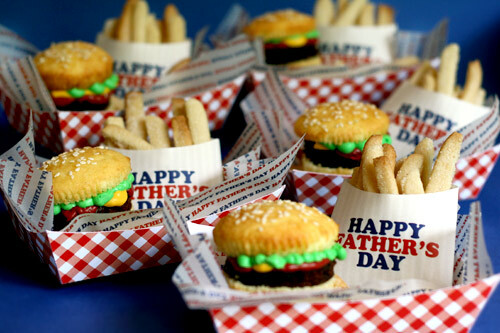 I'd love to try and make these for Father's day but we are off to the lake that weekend. Wow, I am constantly amazed by your creations! I have nothing against box mixes, they are great when I am time constrained! 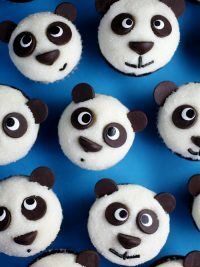 OMG, these are so cute! I'll have to make these someday. Perhaps July 4th, or Labor Day weekend. I don't use mixes normally, but I use them when I have to bake a bajillion of one thing but I only have like 1 hour to do so. It just makes everything so much easier. I also use them when I dont have the time to get ingredients, but I happen to have some mixes. I'm going to be having a party next weekend, and I think I know what dessert will be now! Thank you so much for this! oh my gosh, these are just adorable! They'd be great too for a kid's party..or just about anything! As for mixes, I have no problem with them. My girls are still small and it's a lot easier when they want to help to use a mix. We do cakes from scratch too so they know that way as well. 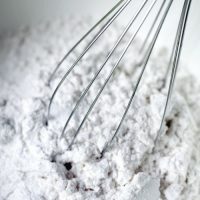 I like the mixes that have you add more to them, like some of the butter recipe cakes, where you add a whole stick of butter as well as eggs and other ingredients. I often substitute milk for water on mixes. OH MY GOSH! This is the cutest thing I have EVER seen!!!!!!!!!!!! And I am a mix AND homemade kinda girl. Depends on the time and amount I have to make it!! Oh. Em. GEE!!!!!!!! These are so FLIPPING COOL!!!!! 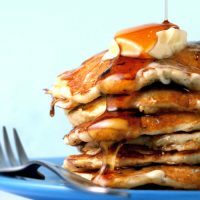 Definitely don't have a problem using mixes, but I have been perfecting my scratch recipes in the last year- so I CAN do it from scratch, IF I am so inclined. 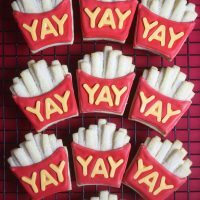 wow, they look amazing, especially the pile of cookie fries. Must find an opportunity to make them! As for the mixes question: I use them occasionally, for specific types of cakes where I know the mix works better than any recipe I've tried. I can't get home made brownies as soft and moist as from the boxes. Also hello, I'm new here. Have been lurking for a week or two but couldn't resist commenting on these!  Oh my….I am saying this with my mouth hung open. You are amazing! 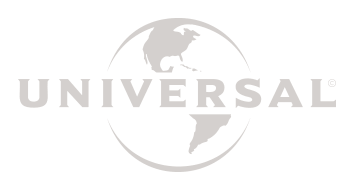 I bump by your site through other links from time to time and this time I am putting you as a fav. on my blog. You are really incredible! As for mixes vs scratch, I've been more prone to using mixes lately. Altitude (nearly 8000) makes it so hard to get a dang cake to turn out right. Any suggestions? Also, I love everything you do. It's so creative! man! 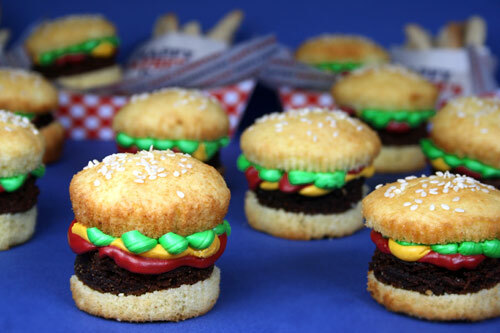 it's hamburgers AND baked goods together! yum!!! I made some cake bites last night/this morning for a party…HUGE hit and no one would have known if I used a mix or scratch. I have 2 kids, 2 and 5, so I use mixes all the time for cakes and brownies. Cookies I prefer from scratch, except for sugar…I can never seem to get those right. But mixes also get us to the fun decorating faster and my kids are way impatient too! improve them! love this post and will share with wifey of a fast-food lover! thanks!! i love that you use mixes and you aren't afraid to admit it!!! i'm known as the baker amongst my friends and they are like shy or embarrassed to mention mixes when they're around me even though i love them as much as them! i adore baking from scratch because it's just fun and you can control what is in your recipe but mixes are also great for experimenting! you can add more or less eggs, extracts, substitute the cup of water for a juice etc… you can easily make it your own. using a box shouldn't discredit the creative baker! to me it's like mac n cheese. we all know that the boxed vs. the real thing are two different things so i count them as different flavors. sometimes i'm craving the cardboardy fake taste of the boxed kind and other times i want the real super cheesy flavor of the real mac n cheese. good cute god! you're my number 1 inspiration and i'll make these soon! I LOVE Betty Crocker Sugar Cookie mix. The only way I make sugar cookies now. one reason- they are delicious. Second- by the time I get ones from scratch mixed, rolled and cut out, I am too tired and sick of them to frost. 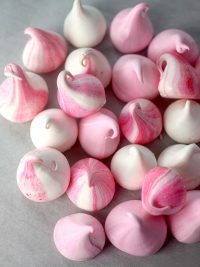 But with the mix, it is SOO easy- I still have the energy and desire to frost!! Also- love Betty Crocker Lemon Poppy Seed Muffin mix. Mmmm. Comes with a delicious lemon glaze. 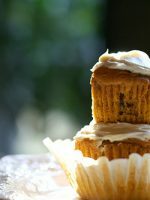 PS: I do not use mixes usually… I prefer homemade cupcakes and so, find them healthier! so cute! what I want to know is, do you make all these goodies for "just because" family & friends, or for customers? Those are adorable. It's funny growing up we would never use mix, partly because we used ww flour and honey when possible, and the preservatives and stuff. Then when I started baking as a busy mom mixes seemed a no-brainer. I now find I like the scratch better but will use them to make with a bunch of kids, and add things like pudding, liquor, etc. Buttermilk sounds like a yummy addition. Have you heard of the soda cake – one box of mix and one can of soda and you have a cake. Improve them! As Sandra Lee would say… its Semi Homemade! 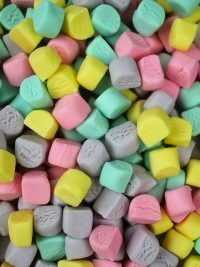 It doesnt take much to tweak a boxed mix… and they save time and money… so why not? and for cakes, it depends on what you want. 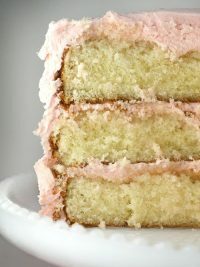 i don't like frosting with cake mixes since they're so sweet already, and seriously, until someone can find me a good natural strawberry cake recipe, i'm all for it! I LOVE THIS! While I was reading your ost I was thinking of making the fries for the Independance Day celebration we have here… and maybe selling them for our Spouses club. Think that would be ok? They asked for baked donations so… I admit it, I use mixes. It's so quick, easy, and cheap when you've got three kids running around the house and ten more on their way over for a party. But I need to be adventurous and improve on them. I'm going to be buying some buttermilk at the store next time I go. OH, I made the lemon bars. Not so good. I think my mistake was in not using real butter. And the oven is tempermental with it's heat settings. Oh well, it was fun to try! I use cake mix all the time. 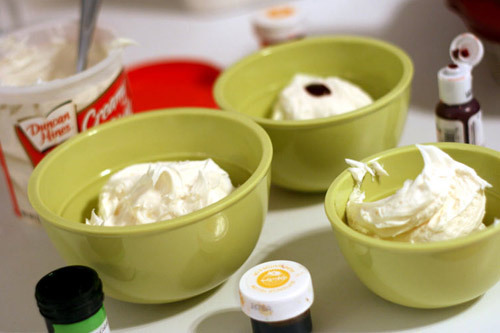 add a small box of pudding and 1 cup sour cream to any cake mix! Use vanilla pudding for white or yellow cake mix and chocolate pudding for any chocolate cake mix! Bakerella, Thanks for including the template! I can't wait to make this for my husband for Father's Day. The kids are very excited! Mixes are a Mom of 3 quick fix for cupcakes. I would prefer to make all by scratch, but when you have 3 kids looking for someting tasty really quick, I reach for the mix! Sugar cookies on the other hand, the kids know it's Mom's special recipe and they have to wait for those! Wow,it's a very good idea! THank you for posting this. This will be the perfect touch on my Daughters Summer birthday pool party :D I know everyone will love it. you are a genius! genius! If you are going to put all that time and energy into the cuteness factor, a mix is a MUST. Sometimes I add a box of instant pudding to give my cake mix cakes a little something extra. I've heard you can also buy flavorings from the cake stores. OMG. Those are so stinkin' cute! I might actually have to try that. My 4 year old would think I was awesome! These are amazing. Until recently I had never used a mix, I had assumed them to be inferior, but on your inspiration I used one to attempt some cupcake pops, and now I use them much more. I am ashamed to say they taste better than my cakes!!! Look out Burger King here comes Bakerella!! I use mixes. Work full time and I have become the cupcake maker for every ones birthday at work. If I had the time i would do from scratch. Thanks for your creative nature. Soooo cute!! It looks easy and thank you so much sharing the templates with us…I'm going to bake these fast food cuties…to muchhh fun!! I think this is the n-st time I say this but it is as true now as the first time a wrote it: YOU ARE A GENIOUS. C'est vraiment génial. Bravo, très beau travail !! Very great, is so beautiful ! Aww they look soooo incredibly cute! I might try these out real soon ^^ Thanks for sharing! These are amazing- you are an incredible and inspirational artist!! Although I do prefer to bake from scratch, if I could get hold of the cake mixes I'd love to give them a try. They're a lot quicker. Actually the brownie mix works out cheaper than making homemade brownies and I'm not ashamed to use it but I think I would be a bit backward in coming forward about it. In the UK you can only get a few of the very popular Betty Crocker mixes and the other makes are quite frankly rubbish. 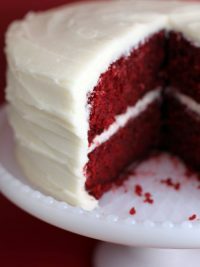 I've always wanted to try the red velvet mix but I've never been able to get hold of one. Actually not getting hold of mixes is a pain as my friend went to New York last year and bought me four Betty Crocker cookery books (cookies and cupcakes etc.) 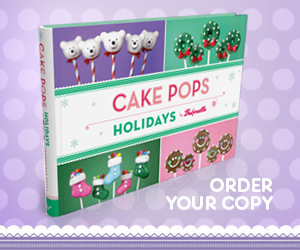 for Christmas and all of them have at least one or two chapters with really yummy modifications to cake mixes. I've alwasy been intrigued by cake mix with pudding. Does that come together in one packet? i'm absolutely in love with this idea…perfection! THey are just so darn cute. I think mixes are great when I don't have the time to bake from scratch. There is no contest though on which tastes better. You are a creative cooking genius!! HOW CUTE!! I hope to one day be brave enough to try them!! 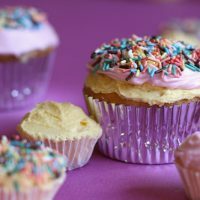 How do the sesame seeds taste on the cupcakes? Can you think of a proper sugary substitution….maybe some type of sprinkles?? I use 'em and modify 'em. I love the book "CUPCAKES! from the Cake Mix Doctor". There are a lot of good recipes in there. 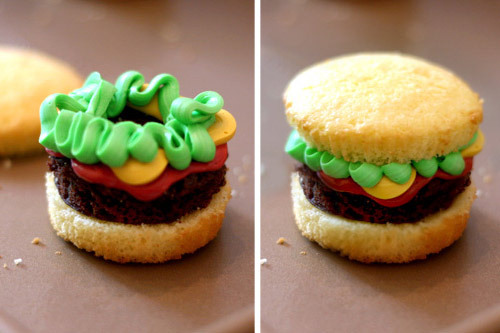 These burgers and fries are too cute. 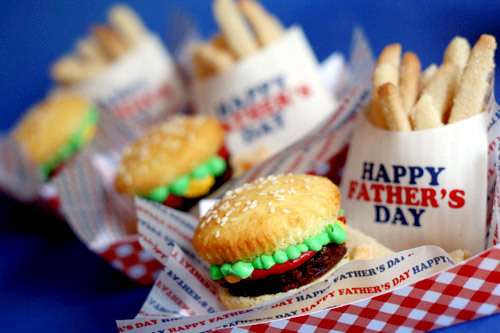 I might just have to make them for my dad this Father's Day! I bake from scratch mostly, but out of convenience and time I will use mixes when I have too and I love them. I have never had a problem with a mix. And I don't ever feel bad when I use them. Those are absolutely amazing! I always use mixes when I bake stuff for the kids — time, ease, simplicity — as it allows me more time to concentrate on the fun stuff. 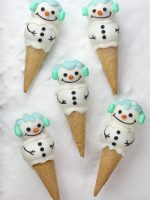 Daddy and I are on the South Beach Diet this year and I am pretty certain these are not allowed… but would be fabulous for a Birthday party! You are always so incredibly creative! 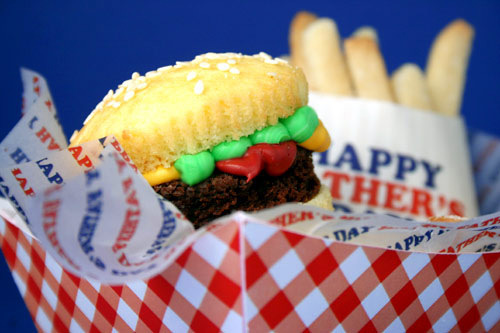 I can't wait until my kids are old enough to bake these with me for their Daddy on Father's day. Once again I am floored by your awesomeness!! You took this to a whole new level. And the the cookie fries were genius!! That is just so awesome – I've got to try this! Just adorable!! The hamburger and french fries are really authentic! Mixes? I prefer from scratch, but in a pinch, I won't stand on ceremony and am very thankful for the quick method! I cannot wait to try these. I've not tried anything of yours yet. These may be the first! Oh my, that is so cute! But, I have to admit, it also creeps me out. I suppose they look so real, I am imagining tasting french fries with sugar on top, or a cupcake with ketchup on it. Yeah, mixes great to use, if you can add a little something extra to them. Except, now that I live in Australia, like Lilia (2nd comment), the mixes aren't near as tasty as the ones in the US and Canada, and there aren't that many options out here either. Oh we are having a get together for Father's Day at my brother's house this year. I may have to do this for that! Everyone would get such a kick out of it! Just got to figure out how to make it travel well…hmmm. Abby- Sesame seeds should actually just give it kind of a nutty flavor! No worries. I can't really taste them though when I use them. Brilliant, as always. Nothing wrong with using mixes, for goodness sakes. They look like so much fun to make!!!!! Nice job!! 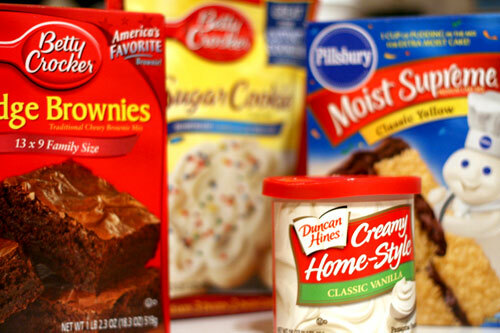 I use mixes and bake from scratch too…I love to experiment. Have you tried mixing a can of pumpkin with a cake mix?? Nothing else…just the can of pumpkin. It's a Weight Watchers recipe and it's actually really good. I love mixes! I don't usually use cookie mixes, but definitely brownies and cakes! Not always, but mostly! So My question is, what are you doing with all of these?????? AMAZING! I think I may try this out for my Sunday School class. It might be fun for all of the dads. I love your work… you are so creative. 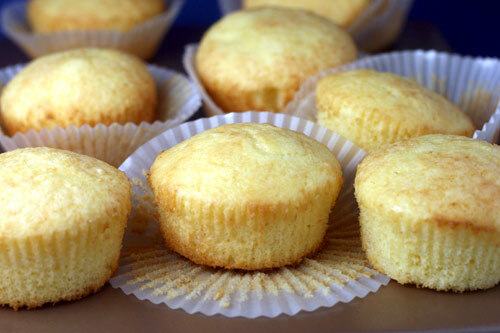 I really prefer scratch baking (gives me a greater sense of accomplishment ) but I don't mind doctoring a mix…1 boxed cake mix, plus 1 small package of instant pudding, plus an extra egg, plus some extract (keeping with the flavor of the cake) makes for a thicker more homemade texture. 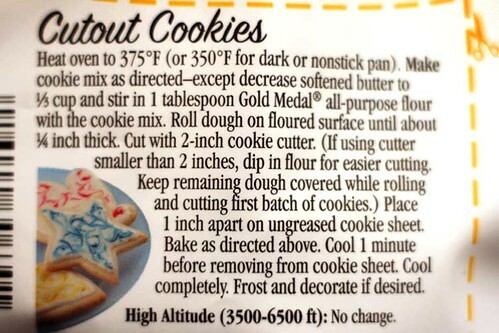 I can't use store-bought icing though. Nothing beats homemade buttercream! I am in awe of your creativity and talent. 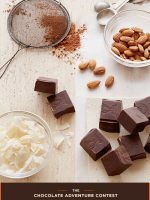 I use them in a pinch, especially for brownies – I can never get my brownies from scratch to come out correctly! They ALWAYS stick in the pan or overbake for some bizzare reason. I keep blaming my oven, but I think I might be the real problem! I love the idea of baking from scratch, but I have a full life too. So, I often use mixes. I prefer to buy the plain (cheap) brownie mixes and then add my own chocolate syrup to make them rich and gooey. My favorite cookie mix is peanut butter. I bake the mix in a small bar pan and spread a bag of melted chocolate chips over it. Let cool (if you can). 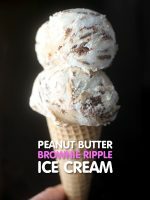 I think this recipe is on the BC PB cookie mix as well. wow! adorable. and yes, couldn't live without the mixes. it's the perfect base to customize.. Very Cute!  Great for Food marketing! How inspiring! 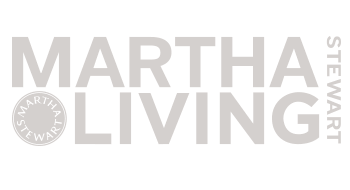 Great Job and I LOVE your BLOG!!!! Thanks!!! Those are too much!!! Perfect for Father's Day or dear Dad's birthday. We will definitely be making those! These are adorable!! A great idea and I think this is a great time to use a mix b/c of all the other steps. Plus, to be honest my homemade brownies are not as good as Mrs. Crocker's. 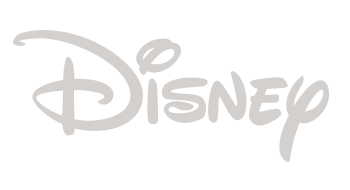 What font did you use or would you make a "Happy Birthday" template? I am seriously in aww…these are so cute I could just die!